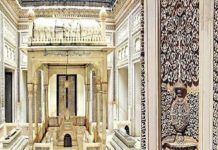 The City of Nawabs is a rare mix of two worlds. One that is the metropolis, has all the things working for it whereas, in some other parts of town, you happen to visit the Gudimalkapur flower market that takes you through an unfamiliar segment of society that is home to almost every type of flowers, greens and floral accessories one can imagine. The market is not only a delight for retailers and people who are looking for wholesale flower buying but also a heaven for shutterbugs! You can spot people here who are busy negotiating with vendors for better prices and photographers that are hunting to capture random expressions. 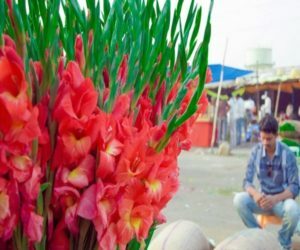 This flower market in Hyderabad presents a good case study for human emotions and a riot of colors as well as brightness that the flower brings to us. 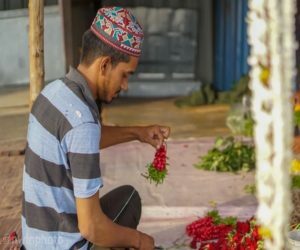 The flowers, though coming from a plant or brush are going to the various destinations Just as the way men come from all walks of life to buy flowers, the flowers are headed to temple, mosques, birthday celebrations or a funeral pyre. The flowers don’t discriminate. The market was earlier a part of Moazzam Jahi Market. It was shifted to Gudimalkapur in 2009. Here, is what you can witness what we call, floral diversity. Besides the destination of flowers, you can see every type of flowers you want. 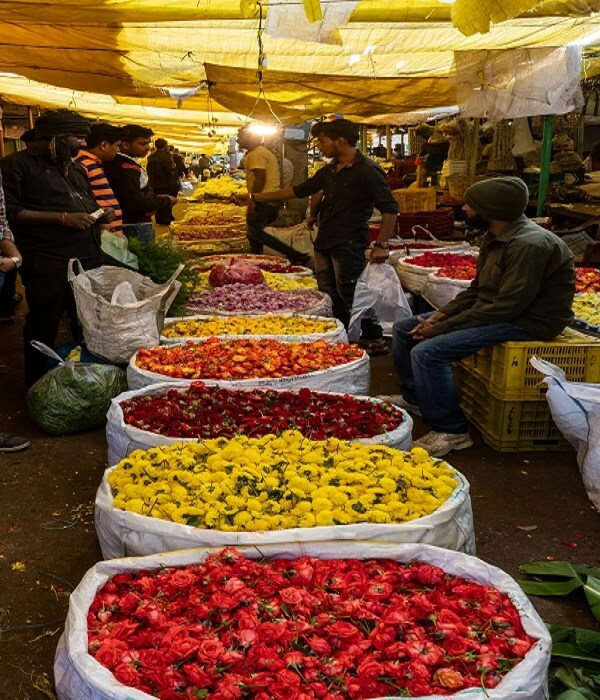 From desi local varieties of rose, Mogra, marigold, daisies, and dahlias to the most exotic types of orchids, tulips and peonies are available here for sale. Loose flowers and floral accessories such as veni and gajras are also found in abundance. You can find vendors sitting on wooden planks, on the floors on the sideways, trying to secure their area with different color of flowers and rugs. The only aim being to sell their produce, for, flowers can’t be kept too long with them. Though you can see that they keep on watering the flowers, trimming the spent leaves and flowers and keeping them in a plastic wrap to keep the petals fresher for a long time but stocking them manually is simply not an option as it consumes lot of time, demands manpower and needs space. If vendors start doing this, they wouldn’t be able to devote time on the procurement of flowers and selling. 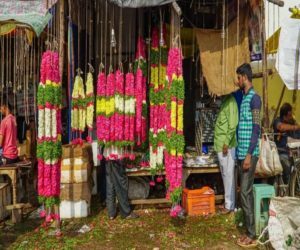 The flower market in Hyderabad faces huge demand on special occasions such like Valentine’s Day, Ugadi, Diwali, and Christmas. With Valentine’s Day around the corner, the price of even a single stem shoots up. The same thing applies for Marigold and daisies in the wedding season since they are very popular as wedding floral décor. The peak season is the brightest not only in terms of the variety of flowers but also business too. Usually, the market’s price strategy works in sync, which is a common feature in any wholesale market. If you are buying flowers in wholesale for occasions like a wedding or religious ceremonies, it is better to ask around for prices and negotiate a bit. Where do the Flowers come from? The flowers are sourced from neighboring cities and states like Chennai, Cochin, Kolkata, Bangalore and sometimes even Maharashtra. 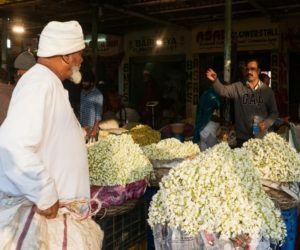 The Hyderabad flower market bustles with activity from sunrise to evening. 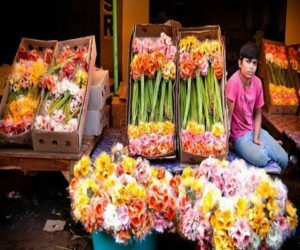 Every vendor tries to finish his stock as soon as possible because perishable items such as flowers can’t be kept overnight. 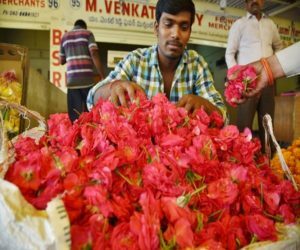 How to Reach Gudimalkapur Flower Market of Hyderabad? Gudimalkapur flower market is not something that is out there in the market. It is a hidden and quiet segment of the society that wants you to walk down the PV Narsimhrao Flyover to the market. See on your left side and there you are! The pleasant and sometimes, the overwhelming fragrance of flowers welcoming you to take a look inside! A myriad range of emotions, from human beings trying to make a living on flowers that are headed to the abode of God to human beings playing God over flowers, which are considered to be the biggest gift to the mankind by God! However, God couldn’t care less! 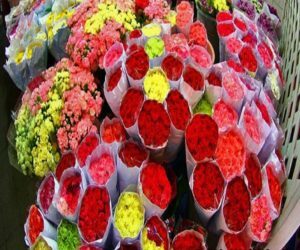 The wholesale flower buying market is a place where you don’t see flowers being considered as anything that you would have believed them to be. It is a business transaction. You pay money, you get flowers. You get flowers in bulk and you don’t have a control over the quality. And this is why, when it comes to gifting flowers to your loved ones, it is always better to stick to your trusted online Hyderabad flower delivery partner so that you get the perfect floral arrangement to complement your big days and occasions. 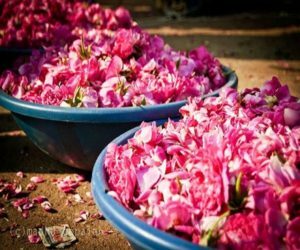 The market starts as early as 5:00 AM and usually, the wholesale buyers close their deals at 10:00 AM and then, it is all up for retail customers who can easily roam around for few stems of rose, a veni or loose flowers for the religious ceremonies. 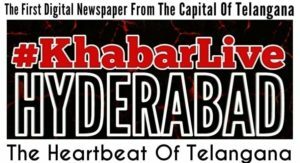 Hyderabad can be really hot and humid in summers. On a rainy day, the colors of flowers are at their brightest but it can be challenging for a visitor to take a stroll around. If are traveling to the city especially for a photo journey, the ideal time would be just when the market starts. You can capture vendors coming in trucks, mini vans and bicycles carrying flowers. Don’t mind the droopy eyes and sleepy mind, because such a vivid canvas of human emotions and flowers is a rare sight. If it happens to be a rainy day, be ready for mud splashes, damp patches, and debris. There is no escape from that. You also need to take care of your camera and lenses on such days. Take care of your belongings. The market can be very crowded and it is suggested that you carry a bag and stay aware of your wallet, phone, and other items. The market and its inhabitants are quite used to the camera. However, it is better and courteous to ask for permission before you start capturing them or their stock. Usually, since it s a peak timing, they don’t generally get involved in a conversation but courtesy never hurts anybody. As mentioned above, you can buy retail and wholesale flowers here but it is always better to stick to your professional florist for delivery anywhere and anytime in India. Don’t forget to take a stock of prices all around the market. This ladies and gentlemen is Hyderabad Flower Market for you. Be it for a religious ceremony, a special occasion or to commemorate the life-cycle human beings can never accustom to, flowers are an integral part of it. This flower market can help you assess and change your perspective about how you see flowers as a gift or in general. It is not just a flower bouquet you receive on your birthday or anniversary. A floral arrangement is the result of collective effort of people who source flowers for you and the team that understands the value of your special moments and hand-arranges a flower bouquet to complement them perfectly. 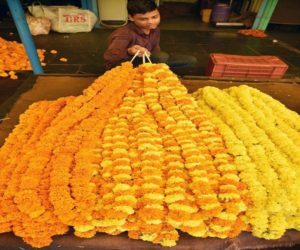 Two of the largest flower markets, at Gudimalkapur and Jambagh, gear up for the puja season. The dark clouds and the drizzle have given way to sunshine. The wholesale flower and fruit sellers at Gudimalkapur near Mehdipatnam are relieved. The compound that houses the largest wholesale flower market in the city is not a pretty picture. The stretch of land leading to the market is uneven, filled with slush and buffaloes loiter around, unmindful of the two wheelers and cars nearby. The vehicles are loaded with sacks of jasmine buds and chrysanthemums, ready to be transported to other markets in the city. On the fringes of the market are rows of shops selling garlands. The younger lot sits perched up on wooden surfaces, weaving the flowers together into garlands. Business is dull, they tell us, since the wedding season is weeks away. 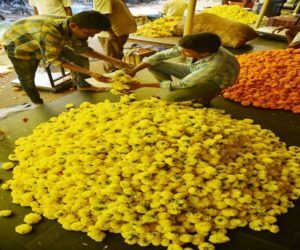 The flower sellers, though, are gearing up for Varalakshmi Puja, which falls on Friday. 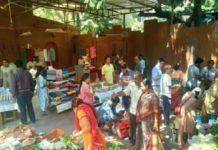 Mounds of marigolds, chrysanthemums, jasmines, pink roses, orange and pink double-coloured roses, deep red roses, ‘tulasi’ leaves, ‘kanakambarams’ and ‘maruvam’ leaves greet buyers. It’s easier if you know the local names. The chrysanthemums are ‘chamanthis’, marigolds are ‘banthi puvvulu’, red roses are referred to as ‘rubies’, the orange-pink double coloured roses are called ‘tiger’ for some strange reason and the pink ones are ‘gulabis’. The sunrays falling on the yellow tarpaulin shelters enhance the golden hues of the marigolds and chrysanthemums. Some of the stock comes from gardens in Shamshabad, while most flowers come from Bangalore, Hosur and Ooty. “These red roses will stay fresh for four days. The going rate today is Rs. 100 per kilo. By Thursday afternoon and Friday, the rates will be higher,” says Chandrakanth, a wholesale seller. A customer tries to strike a bargain in vain. “We don’t make much profit. Our rates depend on the stock and the demand,” says Banu, who sells jasmines at Rs.100 per 300 gm. 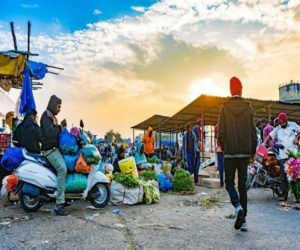 Elsewhere, on Jambagh Road, off the Mozamjahi market, bright blue tarpaulin sheets are in place to shelter the vendors and the stock from brief spells of rain. We walk past the sweet limes, pomegranates, peaches, plums, kiwis and watermelons and spot rows of flower shops. The stock from Gudimalkapur finds its way to these markets, apart from Secunderabad, Ameerpet and other areas. Salman, a resident of Jambagh, unloads a sack of roses as he talks to us. 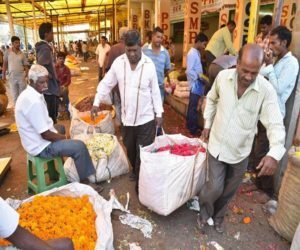 “People come here from Abids, Nampally, Siddiambar Bazaar and other areas to buy flowers,” he says. Salman has been looking after the shop set up by his father. Many sellers in this area have been in the flower business over generations. Their fortunes ebb and flow with the change in season. As the demand goes up, so does the price. Gulabis that are sold here at Rs. 150 per kilo will fetch Rs. 200 to 250 before a festival. 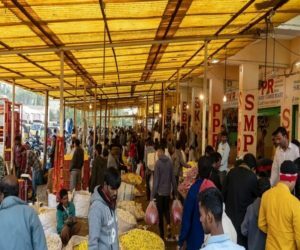 The prices depend on the sum that these vendors have to shell out while sourcing their stock from the Gudimalkapur flower market. “If the prices go up in Mehdipatnam, we have no choice but to hike up the rates here. But the flowers sold here are cheaper than in Ameerpet and Secunderabad, at least by Rs. 15 to 20 per kilo,” says Vinod Kumar, intermittently sprinkling water to keep the flowers fresh. Transporting, storing and selling flowers is one part of the job. Stringing the flowers together is another task. “On a regular day, I make garlands from a few baskets full of flowers. For Varlakshmi puja, we buy a few quintals of flowers. All of us at home — women and children — string together marigolds and chrysanthemums, jasmines and tulasi leaves,” says Saritha, his wife. As we leave the market, what keeps these vendors going during the off season, we wonder. “This is what we know and we are happy doing it,” says Sarita, with a smile. Jambagh, the city’s ground-zero for wholesale market of flowers is buzzing with hectic activity these days. This is the season when big bucks flow into the market. Needless to say, the flowers themselves have become very expensive, thanks to the back to back festivals lined up, including Bathukamma, Dasara and Diwali. 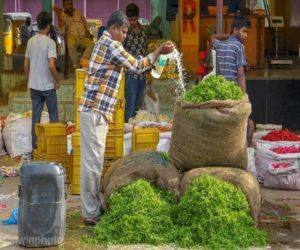 With the government declaring Bathukamma a State festival and announced that it should be celebrated in a big way, there is a mad rush among people to prepare Bathukammas. Every nook and corner of the city now witness Bathukamma events and political parties and various organisations are conducting special programmes. The colourful Chamanti (Chrysanthemum), which usually sells for a maximum of Rs. 50 per kg during normal days is now selling anywhere between Rs. 150 and Rs. 200. This is not all, as the important dates of Dasara and Diwali festivities approach, the prices will see another round of upward revision. “During this season, Chamanti flowers are not grown locally in Telangana region. They are brought from Hosur and Bangalore and that’s why there is a lot of input costs. 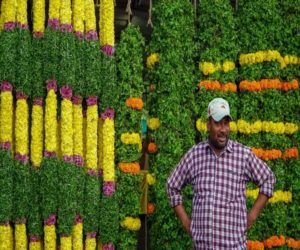 Moreover, the Dasara and Bathukamma festivities have also resulted in a further increase in the demand for flowers in Hyderabad,” says Srinivas Reddy of Bal Reddy Sai Reddy flower wholesalers at Jambagh. 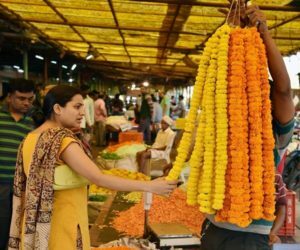 Big wholesale traders at Jambagh during this season between July and October import up to 800 kgs of flowers to meet the demand. 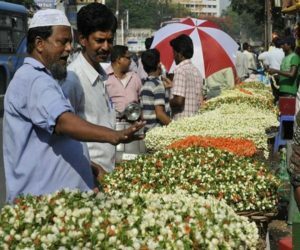 The flower market in Hyderabad depends on seasons in Hyderabad. “Apart from marriage season, the festival season, especially Navratri and now Bathukamma drive up the demand and sales. June to August during monsoons is the leanest period of the year,” Mr. Srinivas explained. In all, there are around 100 to 120 wholesale flower merchants in Hyderabad. “Last week, Banti (Marigold) was selling at around Rs. 10 per kg, but now it is around Rs. 40 to Rs. 50. But, in another few days, the rates could touch Rs. 80 per kg,” said Sai Kiran Yadav, another wholesaler in Jambagh.